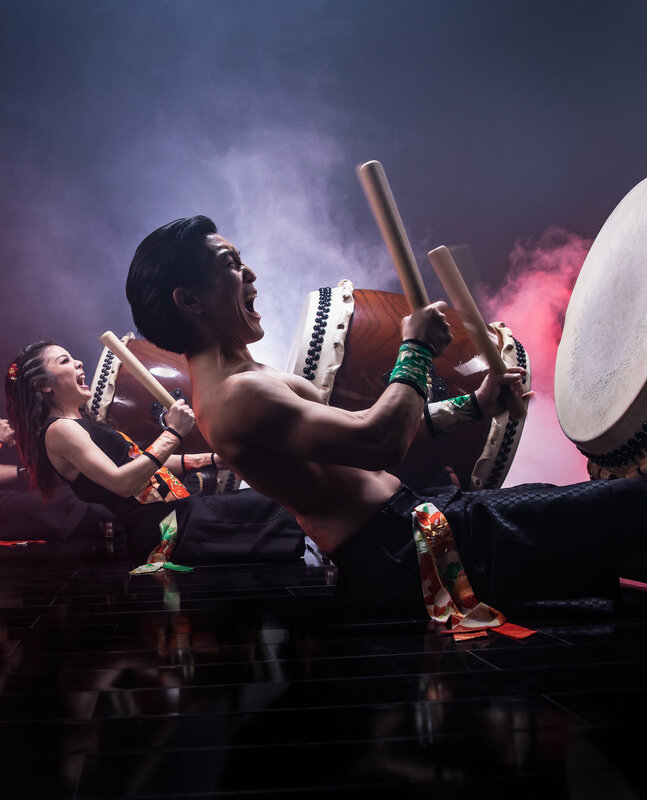 TAIKOPROJECT was founded in 2000 in Los Angeles, California by a group of young, emerging taiko drummers led by Bryan Yamami and Masato Baba. The group continues to define a modern American style of taiko, blending traditional forms with an innovative and fresh aesthetic. TAIKOPROJECT first made waves when they became the first American taiko group to win the prestigious Tokyo International Taiko Contest in 2005, besting all of the Japanese taiko groups in the competition. That year, they were cast in the Mitsubishi Eclipse commercial, the first and still only national advertising campaign to prominently feature taiko. Since then, the group has performed on the Academy Awards, the Grammy Awards, NBC's "The Voice,"Syfy's Face/Off, The X-Factor, rock band 30 Seconds to Mars' "Up in the Air" music video, Conan, Jimmy Kimmel Live, the iHeartRadio Music Festival, and were honored with the prestigious Visionary Award from East West Players. TAIKOPROJECT has performed and recorded with Stevie Wonder, Usher, Alicia Keys, A.R. Rahman, John Legend, Kanye West, producer Squeak E. Clean, Sean Paul, Diplo, as well as international stars such as Greek singer Antonis Remos, Persian singer Mansour, Brazil's Olodum, and Netherlands' Tiesto. They have recently appeared on Ovation TV's "The Art Of", The Late Late Show with James Corden, and Food Network's Iron Chef Gauntlet. TAIKOPROJECT has performed at many of the premiere performing arts centers in the country, including the Ordway Center (St. Paul, MN), Meany Hall (Seattle, WA), Mondavi Center (Davis, CA), Tower Theatre (Bend, OR), Hatfield Hall (Terre Haute, IN), Lied Center (Lincoln, NE), Gammage Auditorium (Phoenix, AZ), Ford Theatres (Hollywood, CA), Cache Valley Center (Logan, UT), Macey Center (Socorro, NM), and the Ferst Center (Atlanta, GA), just to name a few. TAIKOPROJECT programs are made possible in part by funding from the National Endowment for the Arts, the Los Angeles County Arts Commission, the City of Los Angeles, Department of Cultural Affairs, the MAP Fund (Creative Capital), the Japan Foundation, the Sansei Legacy Fund, the Toyota Giving Circle, AAPIP (Asian American/Pacific Islanders in Philanthropy), the Union Bank Foundation, as well as our annual BaseBeat donors.